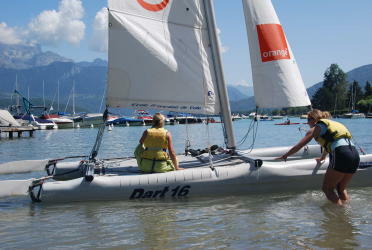 Organization of sports weekend à Annecy : catamaran, hike, bike. 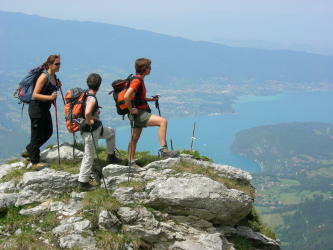 Come discover the remarkable site of Annecy Lake with friends. We propose you our “discovery” program: hike, bike and catamaran. Come make an introduction course of catamaran and benefit of advices of our instructors, drive along the lake by bike, go high on the mountains surrounding the lake, for a beautiful hike with an expert guide knowing all the secrets of the region. Sport outfit, hiking shoes, change of clothes, and swimsuit during the summer. Saturday 1:30pm: we will meet in Annecy, at Talloires or Saint-Jorioz. It depends of the hike scheduled this day (indicated 2 days before). Sunday 9:30am: meeting at our bike renting shop in Annecy (access plan provided at the reservation). We will meet you at 01:30pm for a hike between lake and mountains. From 2 to 3 hours to discover sceneries on which ones each season brings its colors for a sensational panorama. We offer you a half board at the youth hostel or in a vacation village. Morning: Meeting at our bike rental shop. It’s the occasion to discover the bank of the lake on the 25 km long bicycle paths longing it. In the afternoon: meeting at 2:00pm to be introduced to catamaran by a professional. An instructor will follow you on his own boat and will guide you on the manipulation to effectuate.